See here. Reading Medium Large? If not you should. In his usual easy to read and witty style, Matthew Yglesias in his book Heads in the Sand addresses an issue that has long reverberated around the blogosphere. *Q:* Why did the Democratic party keep losing to President Bush on foreign policy issues even under favorable conditions? *A:* Because it didn’t offer a coherent alternative. Yglesias justifies a book length answer by providing a history of both the politics and the policy. His preferred alternative is classical liberal internationalism, an attempt to slowly progress towards a rule-based international system. This ideology dates back to Woodrow Wilson but was first implemented with any success under FDR. Containment, deterrence, and the first Gulf War were all compatible with this idea while pre-emptive war is dramatically opposed to it. Support for this world view began to breakdown during the 1990s as some liberals, including myself, grew frustrated with the failures of the international community to prevent genocides in Bosnia and Rwanda. For the war in Kosovo the U.S. skirted U.N. approval and instead went to Nato to get multilateral support. After 9/11 key liberal hawks started treating a rule-based order as an instrument rather than a goal, pursuing international support was wise but even if the U.N. or a major regional organization did not sign on, a pre-emptive war could still be justified. Yglesias argues that in 2002 and 2004 Democrats often sought to neutralize foreign policy issues either by supporting the President’s policies, critiquing on their implementation, or by pinning our hopes on military veteran candidates. By 2006 Democratic opponents of the war were finally in ascendancy but many liberals in the foreign policy community and the press still hew to the hawk line. Despite popular support for withdraw, Congress has been repeatedly thwarted in part because they have focused on tactical critiques rather than strategic ones. Since tactics and implementation are easy to change, and in some cases have changed for the better, the administration has consistently been able to out maneuver that charge. It may prove even weaker against John McCain who has supported many administration policies but still will have an easier time isolating himself from the President’s personal incompetence. Well, PN Maliki’s make-or-break offensive is still rolling along. Sadr’s supporters have turned out thousands of protestors. See Kevin Drum for other theories on PM Maliki’s motivation. He also provides a terrific cheat sheet for telling the Shiite factions apart. This is useful because they ofteen go by many names. There’s a lot of other good material out there, but I’m kinda sleepy after a big meal and a bunch of wedding planning work. So I’ll just say this. My money is on Sadr winning this round. Massive offensives are a highly questionable counter-insurgency tool. The fact that Sadr’s ceasefire did substantially clamp down on the violence leads me to believe he’s got a pretty well controlled and disciplined militia, "special groups" not withstanding. More specifically, I think they’ll be an inconclusive outcome, Sadr’s people will probably get a few nice PR victories, and Maliki’s credibility will be greatly diminished. That said, I’m just going off what’s in the newspapers. Good, the voters could use the time. It’s pretty miserable out there. Take care. The precipitation wasn’t that bad but the sidewalks were really icy. Not sure how the roads were, local ones I drove on weren’t that bad. My sympathy to the judges (and my Mom who acts as an observer and will now be up an extra hour and a half). Last night I got dinner at Bamian and missed the Democratic debate. I kind wanted to catch that one, so I’ll see if I can find the whole thing online. 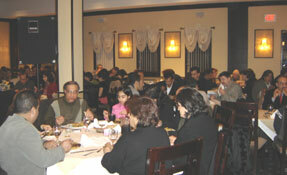 For now though, here’s a review, Bamian is a terrific Afghan restaurant in Falls Church. The atmosphere is nice if not amazing, the location not that terrific, you will have to drive or take a bus from a nearby Metro stop. However, the food is wonderful! Anyways, the place was recommended to me by my Program head when I’d made an Afghan dish for a work function. Specifically he’d recommended the Aushak (dumplings) as an appetizer and Qaubili Palau (rice, lamb, carrots, and more) and Kadu Chalau (pumpkin with home made yogurt which was the dish I’d prepared). So I had the Aushak and it was good, my friend had the Kabob Gosfand and liked it as well. I didn’t get the chance to do the Kadu Chalau this time, but will have to try it when I get back. But, primarily, I am here today to praise the Qaubili Palau. (For the record, I think Qaubili os a different transliteration of the Afghan capital). The lamb was good but the rice, sweet carrots, and raisins (I think there was also some cinnamon) were perfectly blended and tasted incredible in combination. I’m a rice lover but typically I’m not even a fan of raisins in most contexts. The carrot preparation was particularly neat, they made carrot strips, I’m guessing with a peeler, and then just spread them over the top of the rice. Other notes. MY friend was disappointed with the black chai, the green was alright, but based on the waitresses reaction I don’t think they specialize in either. I thought the bread was okay, I’ve heard they have great bread available, but maybe that’s something you can order extra. And, these dishes are pretty big, so unless you’ve got a large group you probably won’t need lots of extra bread. Large group with lots of trading is probably the best way to enjoy this place, but the two of us were still quite happy. Group picture from the Bamian website. I’m guessing they won’t complain since I’m giving them a good review. Am I reading this right? Intel czar Michael McConnell thinks waterboarding would be torture but no waterboarding that was actually done was torture, because torture is a crime and so that would mean that the people who ordered waterboarding (i.e., his bosses) are criminals. But what does this mean? If it’s torture, it’s torture. "Waterboarding would be excruciating," the US director of national security, in overall charge of intelligence, said in the interview in the New Yorker magazine, speaking of the simulated drowning technique that many regard as torture. "If I had water draining into my nose, oh God, I just can’t imagine how painful! Whether it’s torture by anybody else’s definition, for me it would be torture," he said. When asked to define torture, McConnell replied: "My own definition of torture is something that would cause excruciating pain...."
But he told the magazine flatly: "We don’t torture." Waterboarding involves pouring water over the covered mouth of a suspect, creating a sensation of drowning. Water Boarding: The prisoner is bound to an inclined board, feet raised and head slightly below the feet. Cellophane is wrapped over the prisoner’s face and water is poured over him. Unavoidably, the gag reflex kicks in and a terrifying fear of drowning leads to almost instant pleas to bring the treatment to a halt. So, out on a limb here. I don’t have any special sources, I’m just assuming McConnell has picked his words very carefully. Perhaps the cellophane keeps water from dripping into the nose. I think the drowning effect would still happen just from having your breathing passages covered and feeling the water pouring over the covering. So, since the water doesn’t technically enter the breathing passages, I’m guessing the administration would argue that the suffering is psychological and not physical so it doesn’t count. Hence the emphasis on "excruciating pain" in McConnell’s statement. Yup, mental pain is covered. So, if there’s those with more expertise on the specifics of the technique, feel free to correct me about whether this dodge makes sense. But, for now, this is my best guess as to the future propaganda we’ll be hearing.